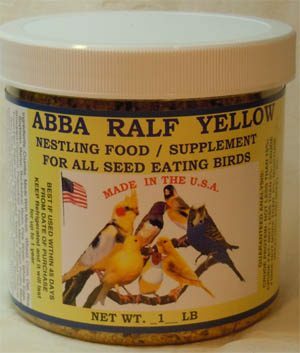 Nestling Food/Supplement for all seed eating birds. COMBINE 4 TABLESPOONS OF RALF YELLOW AND 2 TABLESPOONS OF COLD WATER . MIX THROUGHLY TO ACTIVATE THE INGREDIENTS. ALLOW BIRDS TO EAT AND DISCARD AFTER 24 HOURS. Crumbs Made With Meals: Wheat, Corn, Oat, Rice, Soybean, Barley, Buckwheat, Bean, Pea Water, Whole Eggs, Shredded Coconut, Precooked: Fresh Meat, Fresh Poultry Meat, Fresh Fish; Fresh and Dehydrated; Meals of: Shelled Peanuts, Brazil Nuts, Cashews, Filberts, Pecans, Walnuts, Almonds, Shelled Pumpkin Seed, Water, Ground Coconut, Whole Eggs, Bone Meal, Precooked: Fresh Beef Meat, Poultry Meat, Fish and Dehydrated Carrots, Dandelion, Chicory, Kale, Grapes, Bananas, Apples, Oranges, Pears, Apricots, Milk; Honey, Corn Syrup Solid, Casein, Salt, Brewers Yeast, Yellow Beta Carotene, Cod Liver Oil, Wheat Germ Oil, Dextrose Carrots, Dandelions, Chocory, Kale, Grapes, Bananas, Apples, Ornages, Pears, Apricots, Sunflower Meal, Shelled Peanut Meal, Non-viablem Hemp Seed, Non sterilized Thistle Seed (niger) Kelp Meal, Bone Meal, Milk Honey, Corn Syrup Soldi, Salt, Brewers Yeast, Dextrose, Casein, Vitamin A, Vitamin D3, Vitamin B12, Riboflavin, Niacin,Calcium Pantothenate, Choline Bitartrate, Folic Acid, Menadione Sodium Bisulfite Comples, Pyriodoxine Hydrochloride, Thiamin Hydrochloride, D-Biotin, Ascorbic Acid, Manganes Sulfate, Magnesium Sulfate, Potassium Iodide, Vitamin E, Calcium Carbonate, CalciumPriopionate, Added to preserve freshness, artificial and natural color and flavor .